Our Bell Jar Vacuum Systems offer amazing flexibility and ease-of-use in a very cost-effective package. For maximum accessibility, the vacuum chamber lifts up and completely out of the way at the touch of a button. So it’s easy to load and unload parts, adjust tooling or change components. 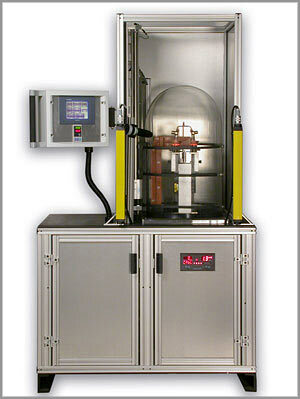 The single chamber unit shown above is designed for laboratory use, prototyping and low volume manufacturing. This unit can also be adapted for high volume, automatic operation with fixturing to move parts in and out of the chamber, and to adjust position as needed. Multiple chamber systems can be driven by a single power supply and vacuum system. Bell Jar heating machines are ideal for melting processes.